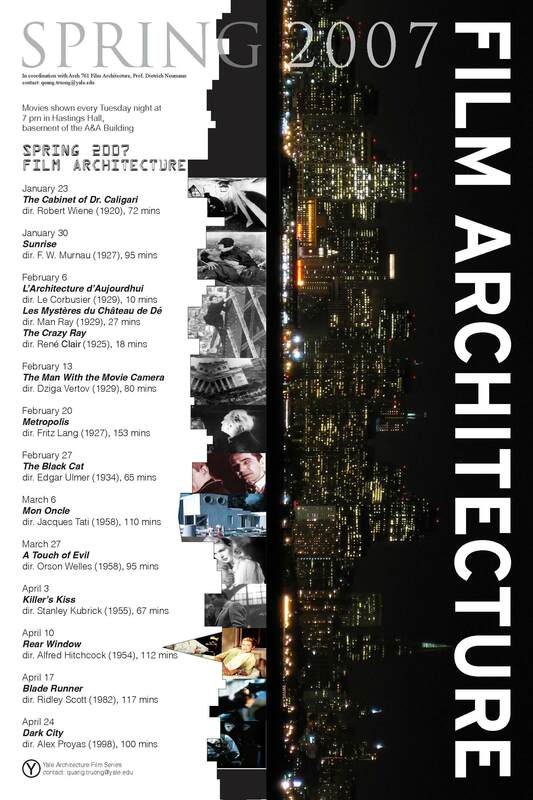 The third semester that I ran the Yale Architecture Film Society, something fairly serendipidous happened: our department hired a visiting professor, Dietrich Neumann from Brown University, to teach a course called specifically, 761b Film Architecture. I corresponded with Professor Neumann before he came, and spoke to him a couple of times about coordinating the class along with the Film Society. We selected the screening list for the semester over lunch one day, and I got to serve as the teaching assistant for the course. Although we have our differences on what are the specific lessons that a study of film can have on the understanding of architecture, it was great to work with someone so accomplished and knowledgable in the (nascent? niche?) study. Not only was he a great source of information, he was a great source of hard to find DVDs. Below is the poster I designed for that semester, and the following posts will be the film notes that I wrote for that semester. Oh, and Professor Neumann’s books can be found here. This entry was posted on Sunday, December 28th, 2008 at 3:59 am and is filed under film architecture. You can follow any responses to this entry through the RSS 2.0 feed. You can leave a response, or trackback from your own site. Hi, I enjoyed your site and was curious if you would like to view my website? It is all about current event news . Tell me if you appreciate it!